Times are tough right now for me financially, and I don't play this uke much since I'm really happy with my Lanikai. So I've decided to sell my soprano blueberry Flea. It was bought new from a dealer about a month ago. It has a plastic fretboard, and I changed the strings to Worth CM which sound wonderful. Like new condition, comes with gig bag. I have a picture below but can send more if needed. Asking $100 plus $10 shipping within the continental U.S. Thanks for looking! Me and Dia go everywhere together. Been playing Dia since 3/28/08. Wow Natalie... sellin' another one? Sorry to hear that the times are going kinda rough for yah! For anyone whose thinking of buying this one - I bought a Kala Mango Tenor from Natalie not long ago. Excellent transaction and quick/smooth shipping! You won't be disappointed! 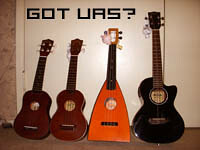 Yep, I've narrowed my collection down to one uke, lol. That's all I need, really. I'm in my 8th year of paying college tuition and it's really starting to get to me, so I gotta stay afloat. All times are GMT -10. The time now is 08:27 AM.